The holidays can be demanding on a man's wardrobe. Deciding what to wear to each special event and outing can feel overwhelming, but it doesn't have to be. In many cases, you probably already have what you need in your closet. Mix and match some staples with fun seasonal accents for a complete holiday wardrobe. Christmas is a busy time with all kinds of different events and gatherings being held. Attend these social events with confidence using the following looks as your inspiration. Hanging out at home by the fire, watching a movie, doing a little decorating, or shopping online for that special gift doesn't really come with a dress code. However, if you're looking for something festive due to a family tradition or just a genuine love for the season, try a sweatshirt or sweater. Want pajamas instead? Those are definitely an option, too. H&M's Pajamas (about $35) look festive without going over the top in holiday mode. There are two plaid color options to choose from and they're made from 100 percent cotton. Bonus: the shirt has a chest pocket. H&M's Sweatshirt with Printed Design (around $30) is perfect if you're looking for something quirky to hang around the house or run the occasional errand in. The Cotton Crewneck Sweater from L.L. Bean (around $100) is a burnished red for a festive look. You may be meeting your significant other's parents for the first time, especially if you live far away. You may even be meeting the whole family at one time. Talk about nerve-wracking! Go the safe route with a sweater and jeans or slacks. The Club Room Cashmere V-Neck Solid Sweater is a pricey pick if you can't get it on sale (regular just under $100), but be on the lookout for sales and discount codes. Layering it over a t-shirt or button-up is optional. Be aware that it does need to be dry cleaned. The Weekday Warrior Non-Iron Straight Leg Cotton Pants from Nordstrom (around $100) may be just the thing you need to pair with your sweater if you're going on a long trip. They're wrinkle-resistant, which is a good thing whether you're going to be wearing them on a long car ride or tucking them into a suitcase to wear later. The 7 For All Mankind® Austyn - Luxe Performance Relaxed Straight Leg Jeans (just under $200) are a mid rise, relaxed style in a vintage blue wash that will work well with whatever you decide to wear on top. Outdoor activities call for warmth from layers. Depending on where you live, you may only need a plain white t-shirt with a flannel shirt on top or a simple long-sleeved t-shirt or henley. You could add a rugged down vest to the outside of that, or your full coat. It's all about the layers though, plus straight leg jeans or corduroys. You'll be ready for hiking, festivals, a date, or chopping down and bringing home the perfect Christmas tree. The Arizona Long-Sleeve Flannel Button-Front Shirt from JCPenney (just over $30), is made from brushed cotton and available in six color combinations, and goes well with jeans and a white tee underneath. L.L. Bean Carefree Unshrinkable Tee, Traditional Fit Long-Sleeve Henley (about $30), is available in regular or tall sizes and eight different colors so you can mix and match. Levi's 501® Original Fit Jeans in "Rinse" will look great with red, green, or white shirts. They're available for about $70 from Levi.com. For low-key nights out with friends or a casual everyday look, a festive or even quirky sweatshirt, sweater, or t-shirt (maybe a short-sleeved t-shirt layered on top of a plain long-sleeved one) with a pair of jeans, khakis, or corduroys on the bottom will work do the trick. Nordstrom's Straight Leg Corduroy Pants (about $35) come in two different colors and are easy to care for (wash cold, tumble dry low). 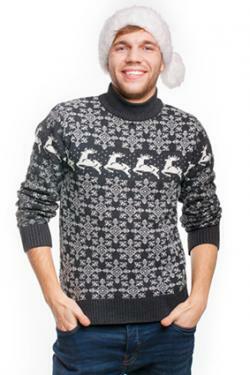 For a funny sweater that is unabashedly holiday-related and not just done in red or green, check the ASOS collection. Prices range from about $25 to $200. Café Press has pages of Christmas t-shirts to choose from. Some are funny while others are a bit more serious. Expect to pay anywhere from $10 to $50. It probably seems like the ladies have it easy when a dressy holiday office party is on the calendar. "Cocktail dress" covers it for them, but what about men? Emily Post recommends a sport coat or blazer and slacks with a dress shirt and tie (feel free to go festive with the tie). If the party invitation says "black tie," go with a black tuxedo with a formal shirt and sophisticated vest. Then don't skimp on accessories, from your bow tie to cuff links. Black tie optional means just what you'd probably think: You don't have to go with a full tux, but could wear a black suit, white shirt, and tie. 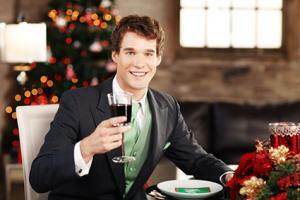 You could even consider going with a dark shirt and tie with your dark suit for a professional holiday party. Semi-formal is still formal, but not necessarily the traditional black suit and white shirt combination. Instead, you can play around with your button-up and experiment with patterns and textures, within reason. If you'd like to purchase a tuxedo and feel you'd get enough wear out of it to justify the cost, check out the Wilke Rodriguez Black Modern Fit Tuxedo from Men's Wearhouse (around $200) or the Armani Collezioni Notched-Lapel Virgin Wool Tuxedo from Saks Fifth Avenue (just over $2000). Both offer classic styling. Nordstrom's Smartcare™ Wrinkle Free Traditional Fit Pinpoint Dress Shirt (just over $50) comes in almost any color you could want to pair with your suit, from black to ecru. You may also see a semi-casual dress code listed as business casual or dressy casual. For men, all of these mean basically the same thing. Wear a sport coat and pair of slacks. For your shirt, you'll be able to choose from a dress shirt, button-up, or polo. Consider your company's day-to-day dress code to determine which of these is most likely the best choice, or err on the side of more dressed up. A festive argyle or fair isle sweater with slacks will be good, holiday-appropriate choices for the annual family photo, but if your family prides itself on creativity and going beyond the norm, don't hold back! Another option is a sport jacket or blazer, simple t-shirt (no plain white t-shirt, though), and slacks, dark wash denim, or khakis. Think a sport coat and jeans makes for a weird combination? GQ says it's A-okay. The Dockers Pacific Washed Khaki (about $60) comes in four colors, so pairing them up with your favorite sweater won't be a problem. Not every man needs to have a tuxedo hanging in his closet, but there are some holiday wardrobe staples you may want to keep around so you can mix and match them for any occasion. They won't necessarily be so festive that you can't wear them throughout the year. A couple of button-ups in stripes or plaids, some slacks, some dark jeans that fit you well, a sweater or two, a casual down vest, a blazer or sport coat, and maybe a suit are all you need to navigate the season.